Former Kaichi School is admired as a quasi-Western-style architecture “Giyofu architecture”. “Giyofu architecture” was born from a mixture skills of Western architectures and traditional Japanese styles. Former Kaichi School was rebuilt and modernized in 1876. Tateishi Seijyu from Matsumoto designed and constructed the new facility. For example, the sculptures of an angel, a dragon, and even school buildings were constructed with a mixture of western, Japanese, and Chinese styles. 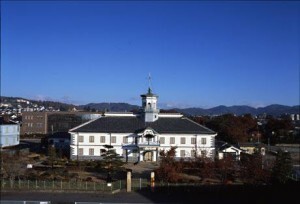 Opened in 1873，the Kaichi School is one of the oldest elementary schools in Japan. The schoolhouse standing today was built in 1876 and had been used for 86 years. The style of architecture was modeled after the manner of Tokyo Kaisei Gakko, the forerunner of the present University of Tokyo, Kaichi school had more than thirty classrooms when it opened and it was reputed to be the most magnificent, beautiful and unique architecture in this district. Today, a wide range of educational materials are on permanent exhibit, including textbooks used in the feudal clan schools (hangaku) and of private elementary schools (terakoya), as well as educational materials of the Edo period (1600～1868) and Meiji-Taisho-Showa period (1868～1989) respectively. Also on display are architectural materials related to the first designation as an important cultural property in Japan for its quasi- Western -style (Giyofu architecture) building in Meiji period. Financial support of public education is shared today by the national, prefectural and municipal governments. In case of Kaichi school, however, 70% of the enormous construction cost was donated by citizens in Matsumoto. Copyright (c) 2014-2019 松本市立博物館. All Rights Reserved.